In yet another case of what is rapidly becoming the norm on Karkee Web, more information on the subject has been discovered since the original article on Naval Undyed Webbing was published. A result of this increase in knowledge was, not too surprisingly, the creation of yet another series of related questions, some of which will be discussed shortly. This new information comes to us in the form of further historical background on the local Royal Marine Reserve Depot dispersal site mentioned at the beginning of this article, as well as certain facts revealed by observations made while studying the characteristics of a half dozen more examples of these interesting artifacts. Dr. Richmond Dutton has kindly provided some further details on the disposal site where these articles of undyed webbing first left government service, along with some thoughts pertaining to a possible explanation of why they were found where they were. This particular RMR depot was located in the old Home Guard depot at Vittoria Dock, a second home, after originally forming at Birkenhead in 1948 on board HMS Irwell in Morpeth Dock. Prior to this incarnation, Irwell had been a trawler base during the war, but as by then it was little more than a hull with a shed on top, the move to the building that had housed the Home Guard Sten range must have been quite a substantial improvement in the local RMR’s headquarters. This contemporary photo, from the 1950, Gale & Polden publication, History Of The Cheshire Home Guard, shows the range in its glory days. 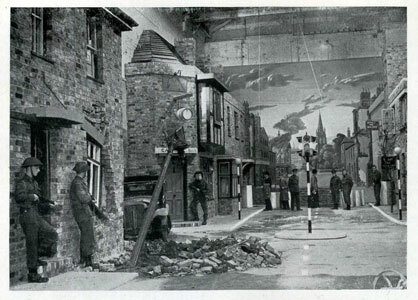 Surprisingly authentic looking, anyone familiar with the film industry would be struck by the resemblance to a typical, Holly, Bolly, or Pinewood sound stage set – complete with a painted backing at the end of the “street”. Therefore one wouldn’t be too surprised to learn that perhaps “Industry” technicians had also contributed their expertise to the war effort here, as well as so many others requiring the art of economical imitation and visual deception. Whether they did or not, what was created in this Blitzed warehouse was believed to be unique at the time. Bulletproof and out of the weather, this urban street setting provided an opportunity for valuable live-fire training found almost nowhere else in Britain. Sadly, at least as far as history buffs are concerned, this area of dockland has now been cleared for redevelopment into dockside apartments, with the RMR moving again – this time to Liverpool. Very little remains as reminder of the strategic role played by the ports of Liverpool and Birkenhead Docks, located on either bank of the Mersey. Long before Gerry and the Pacemakers, then later Herman’s Hermits, this part of the Mersey helped save the land they loved by being pivotal in winning the Battle of the Atlantic. Western Approaches Command HQ was moved to Liverpool on 7 February 1941 and during WW II over one thousand convoys struggled across the Atlantic to steam into the Liverpool and Birkenhead Docks facilities, bringing tons of crucially needed supplies from overseas. With an average of three or four convoys docking every week - every ship and dock demanding security - the number of personnel required for just that particular task would have been extremely high. Those guards were drawn from various Royal Navy and Royal Marine units, with each man wearing the distinctive white webbing that denoted their Military Police-type function. With such a large number of sets of white webbing required, it now makes perfect sense why these pieces of undyed webbing would have surfaced at the RMR Depot closest to the site of these docks. Dr. Dutton reports that even today, white and whitened pieces of web equipment still turn up quite regularly at area boot sales. 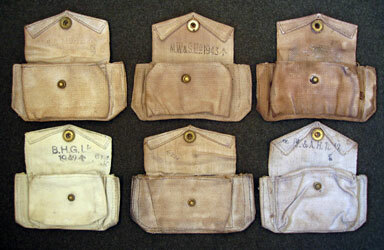 As we will see with a look at this latest selection of examples of undyed Pattern 1919 Cartridge pouches, much more of this equipment must have been made than was thought when the burning heat of the Collectors’ Inquisition was first turned upon it. In response to a request from a member of Karkee Web’s Research Team, Dr. Dutton graciously sorted through the Cartridge pouches he had left in inventory to provide a list of the various manufacturers and markings still available. At that point in time, there were 19 Cartridge pouches left of the original lot of about 50. These 5 were selected as they each had some characteristics different from, or shared with the remaining 19 examples. How many other different makers or markings may have originally been in the total lot will remain unknown, unless KW readers that may have purchased some of these previously dispersed specimens contact the Webmaster and share photos of theirs. The characteristics of the 1942 Mills Equipment Company Ltd. Pattern 1919 Cartridge pouch covered earlier in Part I this article have proven that it was manufactured from webbing woven from undyed yarn, so that battle doesn’t need to be fought again. Likewise, the five additional examples acquired recently share these same characteristics to varying degrees. 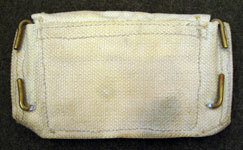 Although the exteriors may vary in condition as well as color shading, from almost pure white through khaki to brown, all five are still white in the interior of the Pouch below the flap. Although not usually noticed when viewed individually, the first thing that becomes quite apparent when looking at these five Pouches as a group, is the startling degree of difference in their size and shape. The width of this sampling varies by as much as a full inch, with the narrowest being the B.H.G. 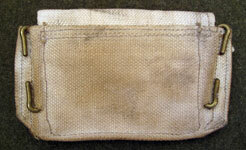 Ltd. at 6 ¼-inches in width, while the two pouches lacking makers’ marks are both 7 ¼- inches wide. Difference in height was not nearly as pronounced, ranging from the three shortest at 6 1/8-inches, to the two tallest at 6 ½-inches. 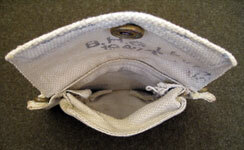 To avoid possible false readings created by the “set” the empty Pouch took during all those decades spent empty and flattened under what must have been less than optimum storage conditions, the height of the Pouch was measured from the bottom middle of the exterior, to the tip of the opened flap. 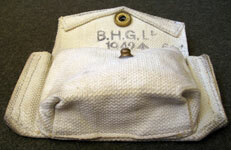 Plainly revealed in the flaps open view is the rather surprising fact that in addition to the previously studied Cartridge pouch made by the Mills Equipment Company Ltd., now at least three more different manufacturers can be added to the list of companies known to have produced undyed web equipment for the Royal Navy. With a closer look at each Pouch individually, arranged in order of size, some interesting characteristics come to light. 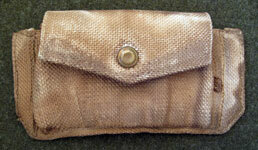 The acquisition of this lovely Pouch, made by Barrow, Hepburn and Gale Ltd. in 1942 was extremely fortunate. It provided to the researcher one of the most valuable pieces of evidence of what undyed web equipment must have originally looked like when newly manufactured. Apart from a little grubbiness on the bottom corners of the pouch, edges and back, somehow this example escaped the ravages of time and poor storage that discolored almost all the other Holsters and Pouches that went to dispersal from that lot from the Birkenhead Dock RMR depot. The years have no doubt somewhat dulled the brilliance of the whiteness of the bleached yarn used to weave the webbing, but for all intents and purposes, this Pouch is new and quite obviously unused. Oddly enough, the top of each belt hook has been slightly spread, as if to more easily fit a waist belt, but the complete lack of rub marks, or any other indication of use, negates the possibility that it was issued. The maker’s markings are relatively crisp, and each piece, front, back and flap; all bear a stamped assembly number. An inspector’s number is also present. Construction method is of the cut, fold and sew variety, and, being the smallest of the Cartridge pouches, the flap-open dimensions are 6 1/8-inches tall, by 6 1/8-inches wide. Manufactured by J. 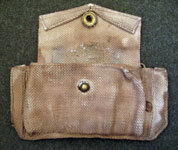 & A. Hillman in 1942, this Pouch exhibits the general, dull, off-white-on-its-way-to-rusty-gray coloration typical of those items in this lot that were allowed to age a bit more gently, without any of the more damaging environmental factors that effected some of the other examples. 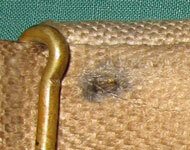 Blurred inspector’s stampings are present, as are sewing alignment markings on the inside of the flap and pouch. It is also of the cut, fold and sew type, but with a bit more consideration paid to economy of material, as will be soon be shown. 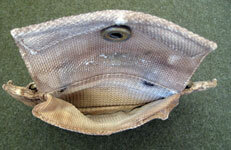 Being slightly larger than the previous pouch, its dimensions are 6 ½-inches tall by 6 3/8-inches wide. 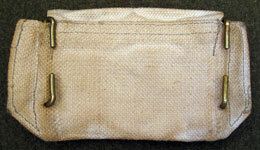 This 1942 Mills Equipment Company product has been thoroughly covered in the Part I section of the Undyed Web Equipment article, so is included here simply as a matter of reference and to also note that this integrally woven Pouch’s dimensions are 6 ½-inches tall by 6 ¾-inches wide. 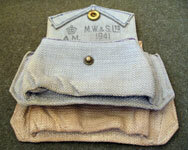 M. Wright & Sons Ltd. produced this Pouch in 1943, while all the other maker-marked examples here were made in 1942. Whether or not this has any significance remains to be seen. There are no inspectors’ marks present, but the reverse bears a large, boxed, “N/5” Naval Depot property mark with multiple Broad Arrow stampings. 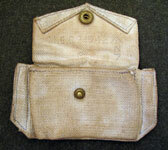 When first viewed, this specimen appears to be nothing more than a typical, khaki, Pattern 1919 Pistol Cartridge pouch. It is not until the interior is examined that the truth of its undyed origin becomes apparent. Apart from the commonly protected area in the folds of the bottom of the pocket, the khaki coloration of the exterior is so uniform that it becomes difficult to believe that this is just a result of natural aging while in stores. Possible certainly, but it doesn’t exhibit the same grubbiness as all the other examples, save the almost new-looking B.H.G. Ltd. specimen. It is tempting to speculate that this change from undyed white to khaki wasn’t accidental. With lots of un-issued white webbing equipment in stores, it would probably make sense to the Navy penny-pinchers to have the color altered to that of a web gear set much more in demand – khaki. Certainly wouldn’t be the first time that sparkling white equipment suffered the indignity of finding itself scruffied up, thus emerging as karkee, but whether or not that is the case here will have to wait for future confirmation. Another characteristic which sets this Pouch apart from the previous three is the appearance of two, rusty, 1/8-inch staples, about three inches apart at the rear of the pouch, approximately 3/8-inches down from the top. These are visible both from the rear and inside the pocket. Just like the M.E.Co. 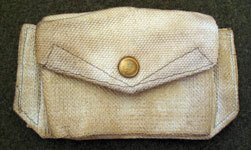 example, this pouch is integrally woven, with its dimensions being 6 1/8-inches by 7-inches. Having no maker’s mark, for identification purposes this Pouch will be labeled simply, “Unmarked”, although there is what faintly appears to be a Broad Arrow at about the 5 o’clock position from the crown fastener on the inside of the flap. The condition of this artifact is the worst of the group, being stained much darker than the rest, with the splotchy evidence of having been wet at some point in the past. Despite this splotchiness, the dark staining over the exterior does call into question, once again, whether this was a result of poor storage, or purposeful manipulation. 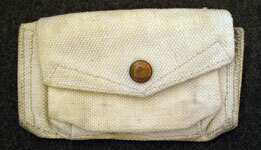 This is the only Pouch to have any evidence of wear to the material. With the flap open, midway between the crown fastener and its stud, there is a rough, thin, circular area, which feels like a finger could be pushed through with very little effort. Normally this would indicate wear from whatever was carried in the pouch, but the clean, unmarred bellows-fold at the bottom of the pocket shows no evidence of anything ever being placed on it. This suggests that this worn patch probably occurred in storage, when something, perhaps the stud of another pouch, rubbed against the open flap, with some sort of weight, perhaps a storage crate, pressing down on the items. Possible scenarios are endless. Probably as a consequence of being wet, the flap material feels a bit rotten, like it is beginning to perish. Unfortunately the crown fastener pulled right through the web of the flap, with the stud portion almost following suit. In spite of these faults, it is an interesting piece. The back has a large, square “N-5” Navy Depot property mark with a single Broad Arrow. 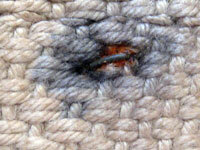 It also has the two small staples noted in the previous example and is integrally woven. As in so many things, size is impressive, as the width of this example is a full inch more than the B.H.G. 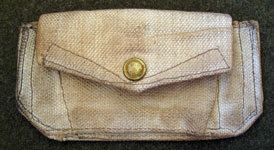 Ltd. Pouch. Dimensions are 6 1/8-inches tall by 7 ¼-inches wide. Another specimen with no maker’s mark, this example will be labeled even more simply, “N-2”, due to the small, ink-stamped, Navy Depot property mark visible on the inside of the flap. Poor storage conditions have dirtied it up, just like the majority of the rest, but it doesn’t show any evidence of having been wet. Also like the rest, the pristine interior of the pocket shows it was never used. This is another employing the cut, fold and sew method of construction, but the sewing machine operator appears to have been distracted at some point. On the left side of the pouch, the inside vertical row of stitches that runs between the belt hook and the interior of the pocket, actually runs almost diagonally, limiting the capacity of the pouch somewhat. On the right side, this row of stitches is vertical, capturing the belt hook as normal, so the diagonal row on the left side can only be considered an error on the operator’s part. 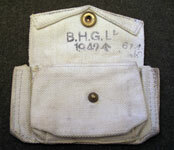 Perhaps this Pouch was the operator’s first completed on a Monday morning, or that operator’s first unit sewn after returning from lunch at the pub one afternoon. Whatever may have been the cause of the misguided row of stitches, this example is in a two-way tie with the previous specimen for widest Pouch of the group, measuring 6 ¼-inches tall, by 7 ¼-inches wide. The more we learn, the more we discover how much we don’t know, so once again, more information, plus more examples, inevitably leads to more questions. At this point in time, having a total of six specimens immediately at hand to study, we have definite confirmation in the form of ink-stamped manufacturers’ markings of four different companies. Those companies are: Mills Equipment Company Limited, J. & A. Hillman, Barrow Hepburn and Gale Limited and M. Wright & Sons Limited. With two Pouches in the sample group unmarked by their manufacturers, we have to delve a little deeper. Naturally, just as in the case of the undyed web Holster without maker’s markings, the lack of same on two of the Cartridge pouches makes them the most intriguing. 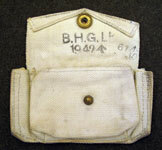 With the Holster, the Canadian-made fastener provides somewhat of a clue, but as both of these Pouches have the typical, British-made fasteners used by over at least three dozen different domestic manufacturers of web equipment during the war (one stamped with Newey Brothers’ “N. B. Ltd.” logo and the other with Mills’ “17061” patent number acknowledgement), we have to look elsewhere for enlightenment. Web Holsters and Pouches are often considered to be composed primarily of two different manufacturing types; Integrally Woven and those constructed using the simpler, Cut, Fold and Sew method. Until an artifact turns up to prove otherwise, it is usually assumed that only two firms, Mills Equipment Company and Martin Wright & Sons, each the other’s major competitor, had the more intricate looms capable of integral weaving. The cut, fold and sew companies can then be lumped into an all-inclusive, “Everyone Else” category. At least that is what this researcher thought until half way through Part II of this article. Turning back to those two Pouches with unknown makers, although both shared the widest dimension of this group of Pouches at 7 ¼-inches, little else was the same. The major differentiation is the fact that “Unmarked” was integrally woven, while “N2” was made using the cut, fold and sew (henceforth referred to more simply as “CF&S”) method of construction. 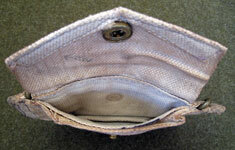 The location of the fastener stud is a rather low, 1 ½-inch from the top of the pocket on “N2”, but on “Unmarked” the stud is placed in the much more usual position of only 1-inch from the top edge of the pocket. The flap on “N2”, at 5 ¼-inches wide, is considerably larger than ‘Unmarked” at only 4 ¾-inches. Finally, the “Unmarked” Pouch has those odd, rusty staples, while “N2” does not.With all these manufacturing inconsistencies, it is extremely difficult to believe that the same manufacturer could ever have made these two Pouches. Closer inspection of all six examples in this little study group reveals that one of these two mystery Pouches may have a sibling after all. 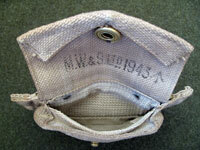 Eliminating all the “CF&S” Pouches leaves us with three integrally woven Pouches: the 1942 M.E.Co., the 1943 M.W.&S. Ltd. and the “Unmarked”. 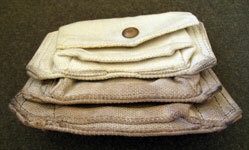 The flap of the Mills Pouch, at 5-inches in width, is 3/8-inches wider than the flaps on the other two pouches. Being also taller, yet narrower than either of those two, tends to eliminate Mills as being the manufacturer of “Unmarked”. The M.W.&S. Ltd. Pouch and “Unmarked” have a couple of other characteristics in common missing from the Mills example. 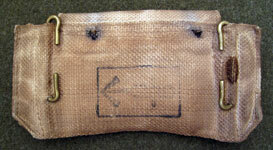 Although the Mills Pouch is marked on the inside of the flap with the simple “N-7” Navy Depot property mark, the back of both of the other pouches has been stamped with a large, “N-5”. 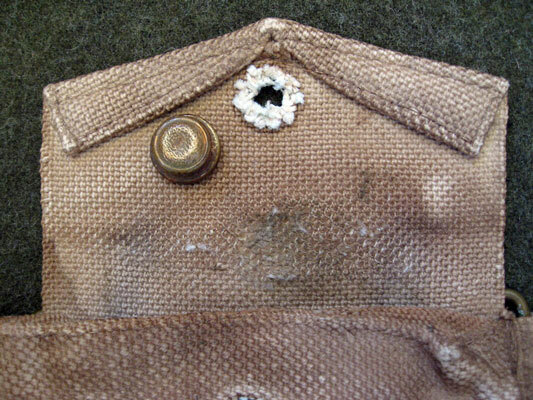 Notice too, unlike the relatively clean back of the Mills Pouch, the backs of the other two are each marred by unsightly spots of black stain in the web caused by the two rusty, 1/8-inch staples driven through the top of the pocket. 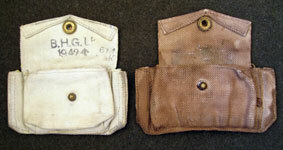 Other examples of these Pattern 1919, undyed web, pistol Cartridge pouches with staples were reported, then discussed by the Karkee Web Research Team prior to the acquisition of this group of artifacts – indeed, that discourse is what actually prompted the search for additional undyed specimens, as well as the instigator for this new section to the original article. This question, in various forms, regarding various subject items, comes up quite frequently in KW discussions – especially Holsters – but as alluded to earlier, wasn’t really very seriously considered until something occurred during the course of writing this article. Having a half-dozen pistol Cartridge pouches on the desk beside the computer for the umpteen hours it took to pound out Part II, it was realized that there were significant differences between the Pouches, other than just those previously discussed. Apart from the obvious variations in measurements, manufacturers, markings and the two major divisions - Integrally Woven or Cut, Fold and Sew - it was noticed, sadly, almost chauvinistically, that in most cases the Pouches had different bottoms. As befits the two prime competitors in the British web equipment industry, the integrally woven M.E.Co. (on top) and the M.W.& S. Ltd. pouches are the most similar in the manner in which the bottoms of the pouch pockets are formed. Even though the same manufacturing technique was used - that is a pocket created on a loom, as opposed to a sewing machine - differences are still apparent. 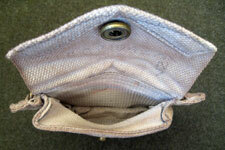 The bottom of the pocket of the M.E.Co. Pouch is almost even with the bottom of the Pouch, being barely 1/16-inch above it. 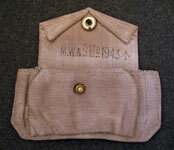 The bottom of the pocket of the M.W.& S. Ltd. Pouch however, is measurably higher, being 1/4-inch above the bottom of the Pouch. The weaving process employed by both manufacturers to create the pockets eliminated the need for any horizontal lines of stitches across the bottom of the Pouch. The Pouches made using the CF&S construction method show a much greater variety of manufacturing technique. The B.H.G. Ltd. Pouch on top of the stack forms its pocket using folded and sewn corners, as does the J. & A. H. Pouch below it, but notice how many more folds of material are visible under the last horizontal row of stitches in the bottom of the top Pouch. The Pouch on the bottom, our old friend,“N-2” without a maker’s mark, isn’t just so much wider than the two above it, but its pocket bottom is completely different. No folded corners here – in fact there aren’t any corners. 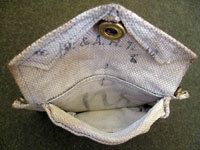 The bottom of the pocket is sewn flat, with the pocket bellows created by three horizontal lines of stitches. These three Pouches were formed using three completely different methods of cutting, folding and sewing to produce the same product. Curious to see if these manufacturing differences might simply be an idiosyncratic result of the particular sewing machine operator doing the final assembly, other similar artifacts available in the collection were examined. 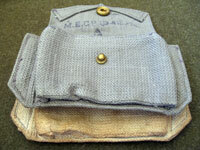 Fortunately, for this research, three of the four manufacturers of the maker-marked undyed Navy Pattern 1919 Pouches were also represented in the form of blue-gray Royal Air Force Pattern 1925 Pouches. Other than color, these are all the same Pouch. In a stroke of luck, most were produced in 1942, with the exception of the 1943 M.W. 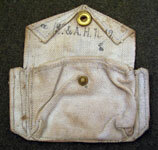 & S. Pouch and its companion Patt. 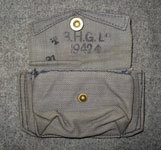 ’25 Pouch made in 1941. 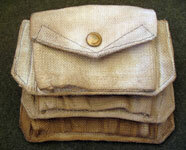 Pairing up the Navy and RAF Pouches by maker reveals a rather interesting fact. While each blue-gray/undyed pair has some manufacturing variations unlike those of the other two pair, those differences are common within the pair. Put more simply, color aside, Pouches made by a particular maker exhibit an identical manufacturing technique. 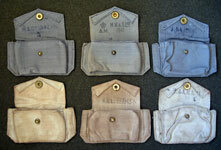 The blue-gray Pouches are all made with the same variations pointed out earlier when comparing the characteristics of the individual undyed Pouches. 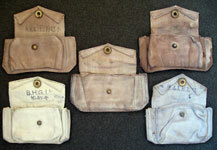 Once again, it is the bottoms of the Pouches that really tell the tale, with each pair displaying that maker’s particular production method. Not only were each Patt.’25-Patt.’19 pair made in the same manner, but as can be seen, when empty they tend to fold and buckle in a very similar fashion. 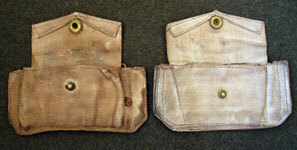 Thus it appears that these manufacturing differences were not the result of which particular sewing machine operator happened to finish up the Pouch that day, but rather they occurred because each of the manufacturers employed their own unique method of constructing the Pouch. In another example of the international quality of KWRT teamwork, prior to publication of this article, Graham Tweeddale sent photos of a Patt. 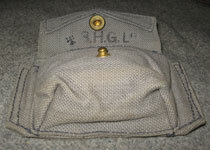 '25, Pouch, ammunition made by B.H.G. Ltd. This allows us to compare a fourth Patt. '19 - Patt. '25 pair by yet another manufacturer. As can be seen by the four comparison photos, despite the pouches being of different patterns, once again the pair was made using an identical construction technique - a technique different from all the other manufacturers. These manufacturing revelations provide enough new information to take a more cognizant look at those pouches with the unsightly staples. Fortunately, thanks to KWRT member Graham Tweeddale, we now have photos of the Pouch with staples that started the original KW discussion on the subject. 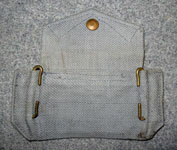 As can be seen in the photos, this third Pouch with staples has features in common with both of the previously discussed two. It too, is integrally woven, lacks maker’s marks like one of them, but like both the others, bears the very distinctive, large, boxed “N-5” Navy Depot property ink stamping, although on the inside of the flap this time, instead of on the back. No manufacturing differences can be discerned among these three Pouches. In light of the evidence presented here regarding the commonality of a web equipment maker’s individual production technique, it is now probably safe to say that all three of these stapled Pouches were made by the same maker; that is, M. Wright & Sons Ltd.
Why the staples are present is another issue. Collectors have occasionally observed other articles of web equipment with staples in them before these were discovered. Those usually appear to have once fastened labels made of paper, calico or other materials, to those individual artifacts. It is tempting to speculate that perhaps those labels might have served to bear contract information on the first specimen placed on the top of a bundle of a new shipment of web items, or possibly inventory information, or even stores codes, while tucked away in a government storage depot. There are surely other explanations. As far as is known at present, those other stapled artifacts only occur individually – not in multiple units. On all three examples presented here, there is no evidence of anything ever having been under the staples. No fibers of paper or cloth are present to peek out from under the edges of the rusty staples. The staples are tight to the webbing, lacking any gaps beneath them. While the oxidation of the staples has resulted in black and rust staining around them, the only thing trapped between the crown of the staple and the staple’s folded prongs is web material. As a staple’s task in life is a simple one - holding a minimum of at least two pieces of some type or types of material together - what function did the staples serve with these Pouches, if not to fasten a label? Looking too deeply into the question tends to obscure the obvious. If there is nothing under the staples but web material, then surely it is web material the staples were meant to hold together. Graham's close-up shot of the staple just to the right of the brass hook is the kind of evidence that removes a line of thought from the nebulous form of theory to the more concrete world of fact. Notice the line of stitching which fastens the flap to the pocket actually passes over the top of the staple. This is irrefutable proof that the staple was there before the flap was sewn to the pocket. As Graham notes, this fastening technique was undoubtedly a bit hard on the sewing machines' needles on occasion. For ease of manufacture, the flap of the Cartridge pouch is made from a separate piece of web material. Integrally woven Pouches exhibit flaps made from webbing woven with a different weave pattern than the body of the Pouch, but with Pouches utilizing the CF&S method of construction, the flap and pouch body are made from the same material. There may be some exceptions to this observation, but it holds true for every Pouch used in research for this article. 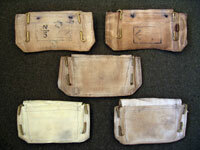 None of the other Pouches have staples, only these three, which we now believe to have been made by M.W. 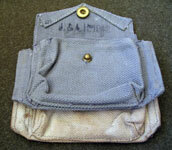 & S.
Even the blue-gray Pattern 1925 Cartridge pouch made by M.W. & S. in 1941 has no staples, so why would these three undyed ones? As we have seen, the ports of the Liverpool-Birkenhead Docks area composed a very critical and extremely busy shipping hub. As such they required an inordinate amount of security personnel, which in turn required a much larger ratio of white, or undyed webbing than would normally ever be needed in peacetime. 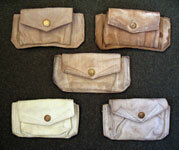 With the exception of the marked M.W.& S. Pouch, all the other maker-marked undyed Pouches were made in 1942. The marked M.W. & S. was made at least a year later, in 1943. The M.W. & S. company was based in Loughborough, Leicestershire; about 107 miles from Liverpool, but the firm also had a facility in Caernarvon, which is closer - only 54 miles from the docks. As Mills’ biggest competitor, M. Wright & Sons had been producing web equipment for years, so would normally have no difficulty in turning out quality web Cartridge pouches that were unmarred by staples, as evidenced by their 1941 Patt.’19 Pouch. As busy as the docks of the Western Approaches were, the contracts that were let with various companies for the production of undyed web equipment delivered in 1942 soon proved to be inadequate. A later contract was awarded to M.W. & S., some samples of which were completed in 1943. Could it be that in an effort to get the contract completed more quickly, the company utilized their closer facility in Caernarvon, instead of their main production plant in Loughborough? If so, the workforce there may not have had as much experience, or expertise, as the old hands back at the company’s home base. 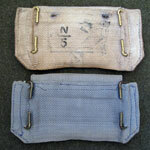 Although the three Pouches with staples were all made using the same construction technique, the inconsistent size and sewing patterns suggest they may have been sewn by slightly less experienced operators than the earlier and later products by the same maker. If such were the case, it would have been an advantage in both accuracy and time saved in the correction of potential mistakes, if the completed loose flaps were first stapled to the Pouch body before any attempt was made to sew those two parts together. Removal of the staples after the Pouches were completed would have prevented the later, unsightly staining, but perhaps in the interest of time saving, it was assumed that the end user would do that. Unfortunately, as these were never issued, the ravages of time took their toll and oxidation marred the webbing. Just when the evidence appears to have pointed to a logical conclusion, another artifact appears from out of the dust (metaphorically anyway) to challenge our deductions. Such was the case when Graham submitted the specimen in the photos above. Being a Patt. 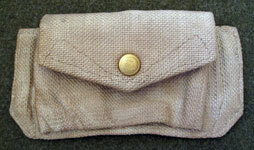 '25 Pouch made by M.W.&S. Ltd. in 1942 and the first noted so far with staples, it appeared that some reanalysis was called for. As has been seen, a 1941 Patt. '25 Pouch by the same maker has no staples. Logically, this would usually lead to the obvious conclusion that M.W.&S. began the staple manufacturing technique some time in 1942, not 1943. 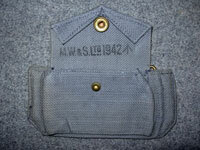 A 1943, blue-gray, R.A.F., M.W.&S. 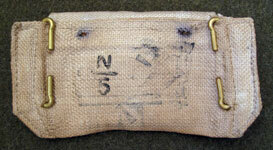 pouch with staples might help provide the answer, but a closer look at this 1942 pouch suggests another possible explanation. 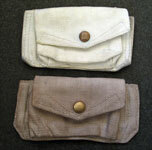 In the photo comparing this pouch to the un-dyed, unmarked by maker, Patt. '19 Pouch, the similarities are obvious - in fact, "Like two peas in a pod!" was the actual description submitted with the photos. The same irregular sewing lines, the pouch shape and especially the staple manufacturing technique, bolster not only the view that M.W.&S. Ltd. made the unmarked pouch, but the opinion that the Patt. 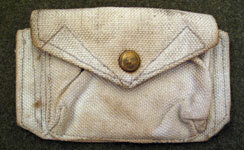 '25 Pouch was also assembled by less experienced sewing machine operators. Thus it appears that the blue R.A.F. 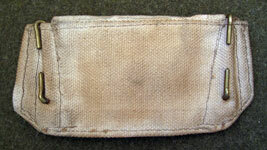 pouch was also made at the same facility as the 1943, un-dyed Patt. '19 pouches - that is, more than likely, the Caernarvon plant. This specimen also provides us with the extra tidbit of knowledge that this same location was also producing Patt. '25 web equipment about a year before the un-dyed Patt. '19 Pouches that are the subject under discussion. As we are all just students of the subject, if any KW reader can supply more information that might lead to a different explanation as to why staples were used on these Cartridge pouches, please don’t hesitate to contact the Webmaster. 1. – “Number of U. W. E. manufacturers?” – So far, no less than six; M.E.Co., M.W.& S. Ltd., J.& A.H., B.H.G. 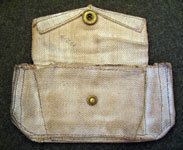 Ltd., the maker of the otherwise unmarked, “N-2” CF&S Cartridge pouch, as well as the unknown, but probable Canadian maker of the Holster with no maker’s mark in Part I of this article. The British and Canadian fasteners used on these last two items indicate that they were probably the products of different manufacturers. 2. –“ Maker of the two unmarked examples?” – Only half solved, as the integrally woven example is almost certainly made by M.W.& S. Ltd., while the CF&S “N-2” pouch is different than all the rest. KW readers please note - we need more examples. 3. –“ Significance of manufacturing differences?” – To the end-user, probably nothing, but to those unfortunates that could be touched with a very short cyber stick – that is those who are rivet-counter enough to care about such things - manufacturing differences can be quite significant. Now that we have discovered that each of the identified companies had their own unique method of constructing their products, we have yet another tool to help identify artifacts with illegible or missing markings. Finally, if after all this exposition, there is a KW reader out there who still doubts that these articles really were made from undyed webbing, further irrefutable proof is presented. The web material sandwiched between the parts of the crown fastener has been protected since the day it was made. 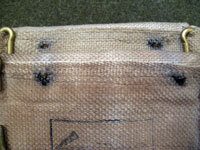 This is what it looks like after the fastener has accidentally been ripped out due to fabric rot. Karkee Web would like to express appreciation, once again, to Dr. Richmond Dutton for his additional help in providing information and specimens to complete this latest installment of the Un-dyed, Pattern 1919 Web Equipment saga. Gratitude is also extended to Graham Tweeddale for sharing the very interesting artifacts from his collection. These examples have contributed greatly to the knowledge base.